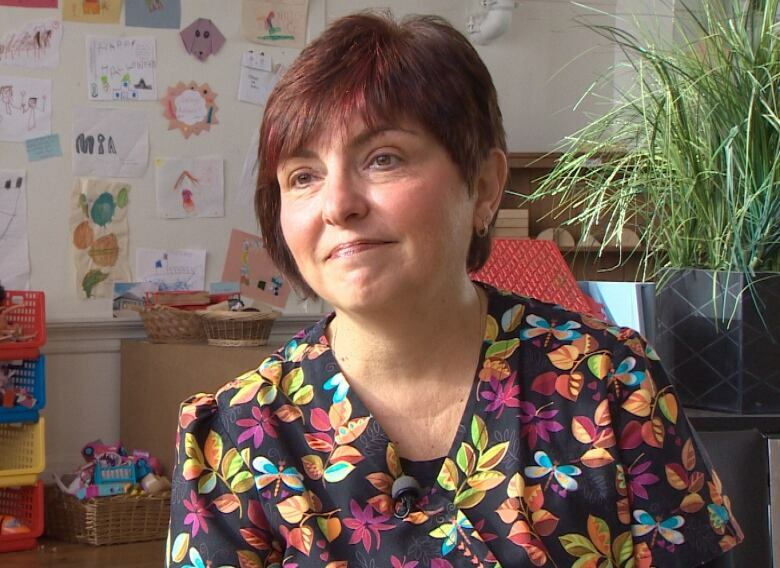 A Saint John daycare operator says it's devastating to turn away parents whose special needs children can't go to school for more than an hour or two in the morning. "I've cried telling parents, 'I can't do this,'" said Avril Wood Toner, the executive director of Origins Natural Learning Childcare in Saint John's north end. Toner said it became a weekly request, coming from families whose school age children had been put on restricted schedules as a result of behavioural problems. She said working parents were desperate to find alternate programming, preferably in a learning environment. "It's not just Origins. There are other daycares out there, dealing with the exact same things," she said. Toner said the phone calls started coming about a year and a half ago with parents asking if she could open up the after-school program at 8:30 a.m. or 10 a.m.
Avril Wood Toner is the executive director of Origins Natural Learning Childcare in Saint John's north end. (Brian Chisholm/CBC)Zoë Watson, the superintendent of the Anglophone South School District, said New Brunswick's inclusion policy does allow for students to be removed from the common learning environment for part of the day and some students have their days reduced. However, Watson said the goal is to reintegrate them as soon as possible. Toner said she was hearing from families with children under the age of 12, who were neither allowed to stay in school or old enough to stay at home alone. One day Toner said she counted about a dozen children in her facility who had additional needs that she felt she couldn't support. 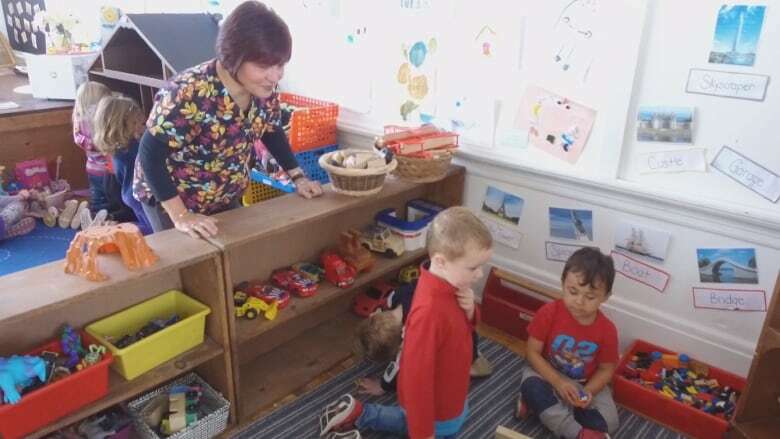 "I have educators here who have a one-year certificate from [the New Brunswick Community College], which is the requirement for licensed daycares in the province," she said. "But a one-year certificate doesn't give you the skillset, necessarily, to deal with some of these children." Toner said she reached the heartbreaking conclusion that she had to reduce the number of students with special needs who arrive in the morning. Toner said she has had to turn away children with special needs who can't attend school for various reasons. (Brian Chisholm/CBC)She started notifying parents that they had to make other arrangements. "I eventually had to say to parents, 'I'm really sorry,'" she said. "We were putting too many strains on all the other programs. I can't stress out my staff, either." She thinks some parents may have given up working hours to spend more time at home. Others probably called on grandparents or extended family, she said. Toner says she could do more to accommodate students with exceptionalities if she could access more funding under the enhanced support worker program. That's provincial funding that allows licensed daycares to hire an additional employee at about $15 an hour. At one point, Toner counted about 12 children in her facility who had additional needs. (Brian Chisholm/CBC)The program pays up to 20 hours per week for a school-aged child who has been identified as having disabilities or special needs. "So there's extra hands," she said. Toner said the money has been harder to come by and she believes that's because there's growing competition for it. Children who qualified in the recent past, don't seem to qualify now. But she said if she could get more subsidies to hire more people, she would open her doors once again. "And the floodgates would open," she said. "Does inclusion work? I'm not so sure," said Toner. "And I think there are a lot of people who feel the same way. "I'm part of a privately-owned company so I can speak out for these children and the families that are dealing with these situations. Some people bound by a union contract wouldn't be able to do this." Toner doesn't want to see children with additional needs isolated in separate institutions or segregated at school all day. But she thinks there must be a middle ground. She said daycares could be part of the solution, but not the way they work now.